My husband is a beer guy. Yes, he loves his smoked meat, his Webers (grill and smoker), his bread, his sourdough starter and his cast iron Lodge pans. He's converting from briquets to wood, from buying bacon to curing his own, from expensive imported pancetta to better-tasting stuff that comes from our basement. On its first outing to Pfriem in Hood River. This makes it pretty easy to come up with some beer-related thingamabob for a birthday or holiday gift. Since he's not a knickknack sort, it has to be more-or-less useful (shirts and glassware qualify), but there's only so much shelf and drawer space available. 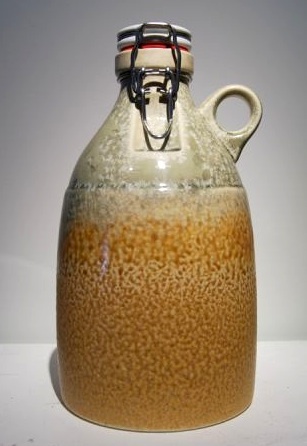 So just before last Father's Day, when I was browsing around my online pastures and ran across a reference to local, handmade ceramic growlers, a big "BINGO!" lit up above my head. 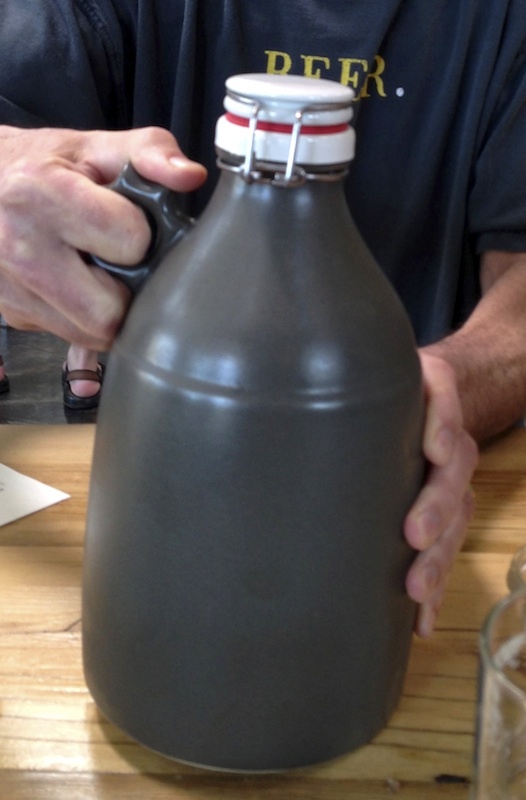 The ceramic, of course, is much heavier than the typical glass growler, but has the benefit of allowing you to pre-chill the full growler in the fridge, perfect for keeping the contents cold for a longer period for outdoor occasions or transporting to farflung destinations. It also pours easily with a minimum of dripping, a good thing since, around here at least, wasting good beer is a sin. So if you've got a beer aficionado in your circle, or if you are one yourself, this makes a perfect, and surprisingly affordable, gift. Especially if you fill it beforehand or, as we did, make it part of a field trip to Hood River and the Pfriem brewery to get it filled. 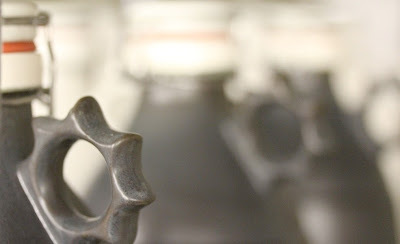 Top photo from Portland Growler Company.